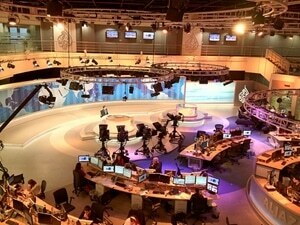 Less than two years since its launch, the cable news network Al Jazeera America finds itself the target of a wrongful termination lawsuit levying accusations of gender discrimination and anti-Semitism. The New York Times reports that the lawsuit was filed by the network's former director of media and archive management, Matthew Luke, who claims he was fired after he complained about being forced to omit female employees from meetings and projects they had previously been involved with. Luke singles out his supervisor, Osman Mahmud, for exhibiting both sexism and anti-Semitism in the workplace. In one example of the latter, Luke says that Mahmud wanted to replace an Israeli cameraman at the network with a Palestinian cameraman instead, allegedly saying that "whoever supports Israel should die a fiery death in hell." But upon reporting Mahmud's behavior to Al Jazeera America's human resources department, "the response was to circle the wagons and fire the messenger," Luke's attorney tells the Times. "This is a clear violation of the law. One would expect more from an organization whose mission statement is 'to be recognized as the world's leading and most trusted media network.'" Luke's wrongful termination complaint was filed on Tuesday, April 28. That same day, two Al Jazeera America executives announced their resignation from the network, one of whom was Diana Lee, executive vice president for human resources. At the time of the report, it wasn't clear if there was a connection between the lawsuit and the resignations. It was also not disclosed what Luke is seeking in terms of damages. If you believe you have been unfairly let go from a job, schedule an appointment with the wrongful termination lawyers at The Meyers Law Firm to discuss your next steps for legal action.